I put a cradle to cradle carpet in my house. It’s in the bedroom for two young children in a family which has moved into the house to live there. By “cradle to cradle’ I mean the carpet is fully recyclable. What it’s made of can be used to make more carpet, again and again. Cradle to Cradle or C2C is a concept developed by those wanting to create a certification system for building products that are healthy for people and the planet – where the manufacturing system and final products are able to be reproduced in an everlasting circle. I looked at several carpet brands in some detail before choosing a carpet called Ecoworx made by a US based company, Shaw Contract. 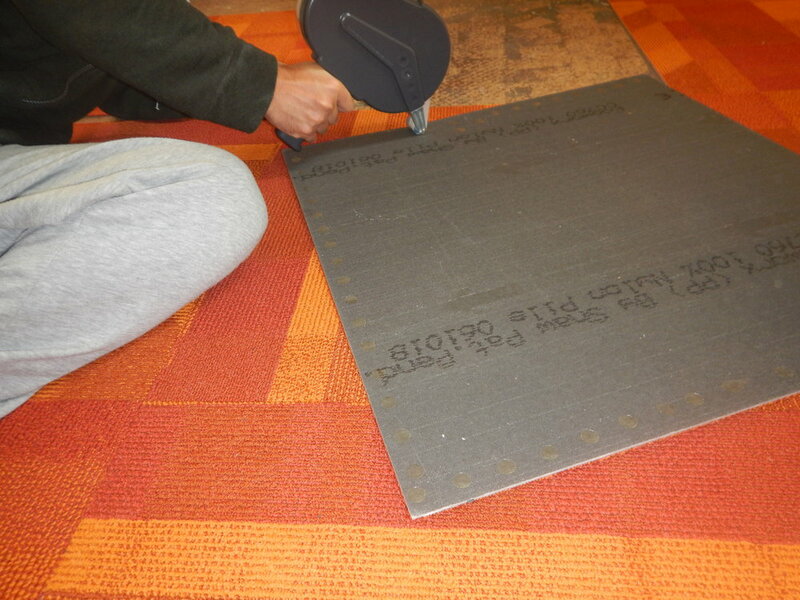 My son, Julian, and a friend, Gus, laid the carpet using instructions on the cardboard in which the carpet was delivered. Neither had laid carpet before. It took them a couple of hours. 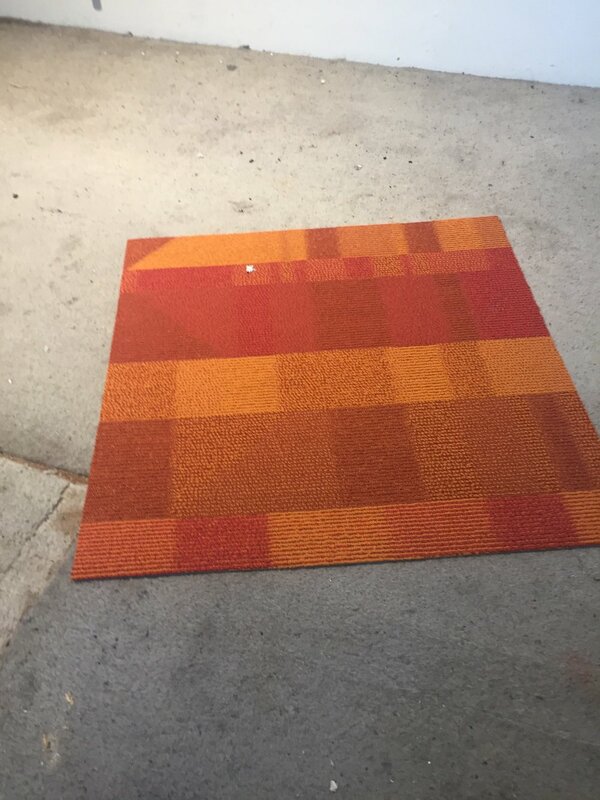 The carpet was in square tiles. A strip of gluey ‘dots’ about the size of a 5 cent coin was laid on each tile using a hand held dispenser, and the tile was then laid down and stuck to the timber floor. 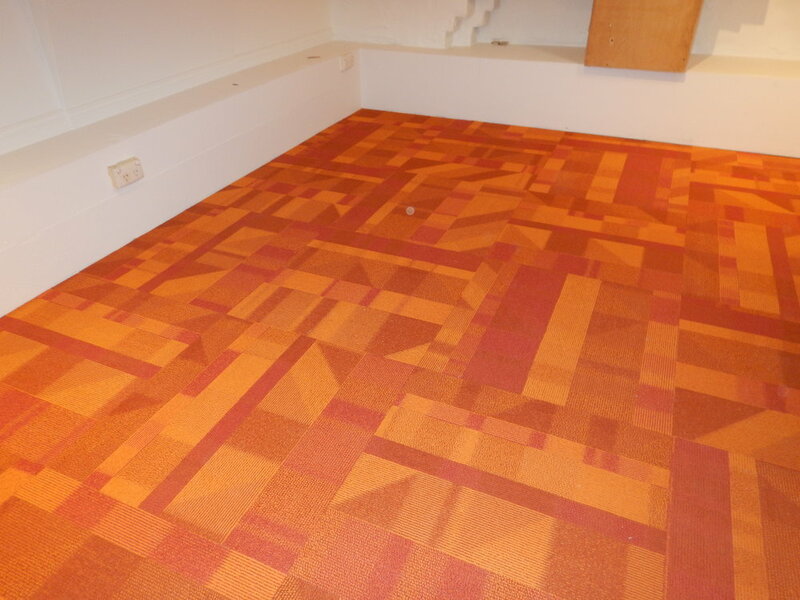 The carpet replaced a broadloom carpet laid in 1991 and made by another company. Broadloom carpets use four ingredients; timber strips with pre-nailed nails which are nailed along the edges of the space being carpeted; plastic underlay; glue to fix the underlay to the floor, and the carpet itself which is stretched out over these ‘foundations’. A drum of glue for underlay weighs around 20 or so kilos. The dispenser and strip of dots for the EcoWorx weighs about 400 grams. Removing the carpet, then the underlay then the nail-filled timber strips took one person four hours of chiselling and hammering. The glue for the underlay was almost impossible to remove, and both the glue and timber strips were ferocious in their grip on the timber floor. When removing the strips and gathering them up and carrying them away from the work area it was my experience that it was almost impossible to avoid getting punctured hands and fingers from the numerous nails sticking out from the strips. Recycling the nailed timber strips is almost impossible, at least, for me, and I could not work out a solution so it went to landfill. Generally, the content of broadloom carpet varies widely, from oil-based products to natural fibres. What is a ‘sustainable’ carpet? Why did I choose the EcoWorx product? The key question for me was, was the material I was to buy fully recycled? There are two parts to the answer to this question; what’s in the carpet I was to use and to the waste from it which I was discard during installation?, and, what happens to the carpet I use when it is replaced? Firstly, what’s in my carpet? The recycled content in my carpet is ‘46% by weight including 33% pre-consumer recycled content and 11% post consumer recycled content”, and Shaw Contract, “ . . . guarantees [worldwide] that when it reaches the end of its useful life, Shaw will collect and recycle the EcoWorx into new EcoWorx”. What happens to my waste carpet from the installation, and when it’s replaced? The brand is recent to Australia and so far has a lower public profile than some other brands which I decided not to use because they weren’t as sustainable. · Contain toxic ingredients, such as, for example, the more widely-known Interface carpet. I’ve been scrutinizing the Interface product and have decided the company’s history shows its carpet is not and won’t be sustainable. For over a decade Interface has been promising it will achieve recycling by 2020. For several reasons I no longer trust Interface and see it like other products which promise to become sustainable but don’t. I could not find from its website an explanation of why it has not achieved recycling now when other manufacturers such as Shaw Contract and some of IKEA rugs are being recycled. “Even with robust life-cycle toxicity data (such as the chlorinated emissions from a PVC supplier), plotting it in a graph next to greenhouse gas emissions is scientifically meaningless and emotionally explosive, given that potential health impacts are far more personal and comprehensible. We were about to learn this lesson the hard way. As a pioneer in sustainable business, we had become accustomed to educating others on sustainability and didn’t recognize that our data-driven approach to explaining our continued use of PVC failed to address the more personal questions around human health impacts. Small wonder our LCA graphs, showing a smaller environmental footprint of PVC relative to other common carpet tile backings, were not always well received. The dynamic evolved into one that could be described as a mutual feeling of betrayal with some of our most sophisticated customers and allies in the green building community. They couldn’t believe that Interface, a company they respected or even loved, would continue using PVC, while we couldn’t believe they would question our commitment to sustainability over this issue, given our overall leadership. It wasn’t until 2008 that Interface began to shift from defending our use of PVC to listening and openly acknowledging the problems with the PVC life-cycle. Today our GlasBac RE carpet tile backing contains no virgin petrochemical ingredients, about 13 percent recycled PVC, and 98 percent total recycled content, primarily from old carpet tile and our own manufacturing scrap. Currently, about 20 percent of Interface’s U.S. carpet-tile production is made on this recycled backing and we plan to increase this production dramatically now that the technology is established. From the installation there is left-over carpet, about 8 tiles and some off-cuts. 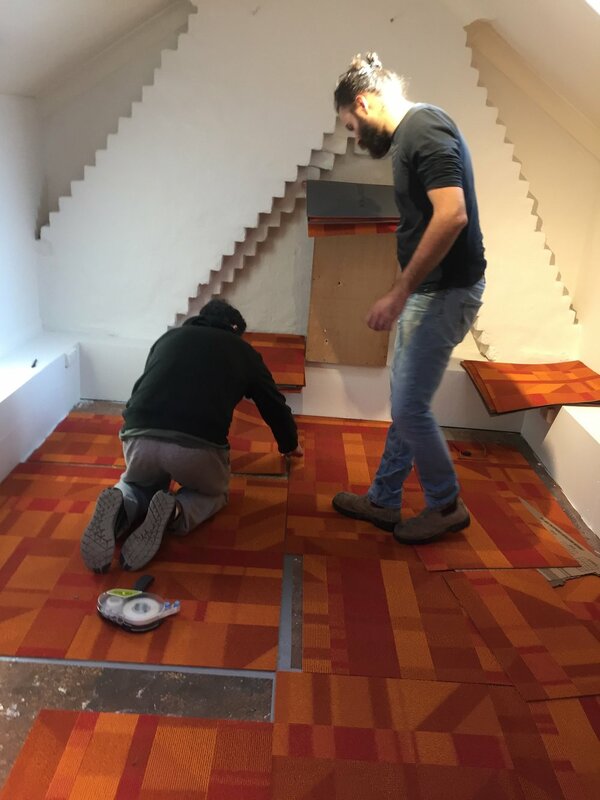 I have some exciting ideas for recycling my left over EcoWorx carpet and will discuss them with the manufacturer and let you know here in another blog what we achieve by working together with my own waste. I’m doing this because the amount of left-over carpet is too small for recycling by Shaw Contract. All in all, an interesting project in my house.